I am currently reading about the In-N-Out story (In-N-Out Burger – A Behind-the-Counter Look at the Fast-Food Chain That Breaks All The Rules by Stacy Perman). If you not from the West Coast (historically California, but there are now locations in Arizona , Nevada and Texas), you may never have enjoyed an In-N-Out experience. In-N-Out is the quintessential Southern California hamburger chain that was founded in Baldwin Park, California by Harry and Esther Snyder in 1948. My quick analysis shows that the number of Facebook Fans per location for In-N-Out is almost 8 time the closest competitor and more than 25 times McDonalds which is the largest fast food chain. This demonstrates that size or the number of locations are not always predictors of social media success. How did In-N-Out earn and grow this loyally rabid fan base? What have they done differently than their competitors? Do they have any social media secrets? How can other brands build a similar mystique and popularity. Keep it real simple — In-N-Out has had the same menu for the last 63 years (other than switching from Pepsi to Coke in the 1970s) and they have never varied from a simple approach of providing the freshest and highest quality ingredients for their menu. Do one thing and do it the best you can — In-N-Out has grown organically since 1948 and all of the locations are company-owned (no franchises). They located their restaurants near popular exits off of the burgeoning Interstate Highway system and far enough away from each other to create scarcity. They built their distribution system and located their stores so they could deliver fresh hamburger, buns and other ingredients to every store on a daily basis. Hamburgers are never frozen and french fries are made from potatoes that are cut in each store. Know your customers — In-N-Out initially catered to the car culture of Southern California and the founder owned a drag racing strip in Irwindale in the 1960s. They were also able to leverage the growing legions of Southern California surfers who could not pass up a chance for a Double-Double burger on the way home from surfing. They have provided their customers with a consistent and quality experience for more than two generations. Pay attention to the details –In the beginning, Harry Snyder personally inspected every potato and had very high standards from his ground beef providers. One of the reasons for the slow growth was that Harry wouldn’t open a new restaurant until he had a valued and experienced employee who he could trust with managing the location to his exacting standards. All employees learn the business from the bottom (generally picking up trash in the parking lot) and gradually work their way into more responsibility. Build a strong corporate culture — In-N-Out created the In-N-Out University where they were able to imbue and reinforce the corporate culture for all new managers. Rule number one was that “the customer is always right”, and rule number two was “if in fact, the customer was not right, refer to rule number one”. In-N-Out was able to maintain their culture through a slow and controlled growth strategy – and they would only open a new location when they knew that they had another manager, fully trained and steeped in the culture, ready to take over. Treat people right — In-N-Out still runs more like a family than as a business. Even in the beginning, employees were referred as Associates and not just ‘ the help’. This treatment led to many employees starting at In-N-Out and remaining there for their entire career. In-N-Out has always paid more than the competition, and the current starting pay is $10 per hour and all full-time employee are eligible for health benefits. As a result, In-N-Out’s employee turnover is much lower than the industry average which contributes to a consistent experience in every store and to maintaining the corporate culture. You cannot argue with In-N-Out’s success, but some of In-N-Out’s strategies are actually counter-intuitive to social media best practices. Keep it simple — The strength of keep it simple means In-N-Out fanatically sticks to their tried-and-true model and that they never experiment with new menu items or new concepts. Social media is all about experimenting with new ideas, so a keep it simple formula is counter to what is generally associated with social media. Slow growth — In-N-Out took the slow route to growth and remains a private company today compared to other fast food chains that became public companies and added locations and franchises as fast as they could be built in the 1960’s and 1970’s. Traditional social media wisdom is to grow fast, capture as many eyeballs as you can and grow customers. On the other hand, the slow growth for In-N-Out led to scarcity and built even more loyal customers who willingly went out of their way to get their burger fix. Closed — While social media is all about sharing and openness, In-N-Out does not share much information publicly and they never have. In fact, they have never spent much money on advertising and it does not appear that they are spending many resources on social media. The have an inactive Twitter account and it appears that they only passively manage their Facebook account and rarely engage with their customers. I would generally recommend that restaurants engage with customers on Yelp and Foursquare as well, but it does not look like they are doing that either. Share more — As an In-N-Out fan, I want more background information on your company. I want to know about the people and the behind-the-scenes stories that make In-N-Out the great company that it is today. The book talks about Hamburger TV and the employee newsletter that is shared monthly, and I would just like to see some of that content shared publicly. I also want to read a corporate blog that gives me an in-depth perspective on what is going on at In-N-Out. Engage more — I would like to see more active social media engagement from In-N-Out. Post on your Facebook Wall, start a customer fan community, and offer more ways for customers to talk about and interact with other In-N-Out fans when we cannot make it to a restaurant. Oh, and stop ignoring your Twitter account. 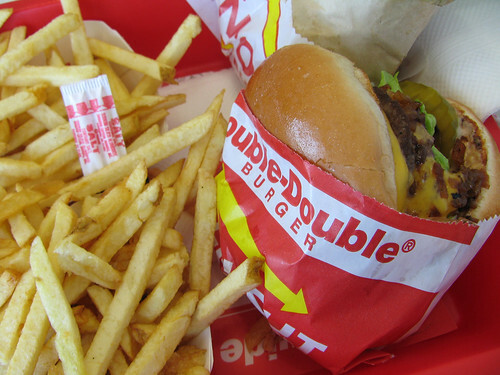 Writing this blog post and reading the book have definitely given me a hankering for a “Double Double, Animal Style”. I’m so lucky to have 2 locations within 5 miles of my house and I’m on my way to grab a quick lunch right now! What is Your Brand’s Zero Moment of Truth? Everyone acknowledges that marketing has changed since the advent of social media, and I ran across a free eBook from Google this week that really hammered the message home. The eBook is called “Winning the Zero Moment of Truth” by Jim Lecinski, Google’s Managing Director of US Sales & Service and Chief ZMOT Evangelist, and was originally discussed in a Google blog post in March 2010. 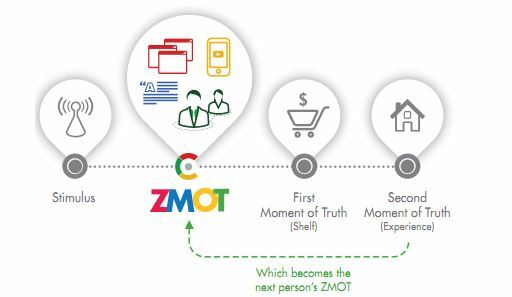 Essentially, the Zero Moment of Truth (also known as ZMOT) is an update on the First Moment of Truth (FMOT) coined by Proctor & Gamble in 1995 to define the first interaction between a consumer and a product on a store’s shelf. At the time, P&G considered this the most important marketing opportunities for a brand. With the rise of social media, the FMOT is still important but most interactions take place before a consumer ever sees a product on a shelf. Consumers are now using the Internet to search for products, review product websites, compare products and prices, read reviews and comments, see what their friends recommend, check out technical specs…and the list goes on. The key for all brands and companies is that “the conversation is already going on” whether you as a company are participating or not. Companies cannot really start or stop it, but can choose to engage or not to engage. As an example of the growth of ZMOT phenomena from the book noted that 37% of shoppers surveyed in 2011 found online social sources to be an influential driver when making decisions compared to 19% in 2010. ZMOT is not limited to consumer or retail goods, but applies in B2B situations as well. Personally, I am a big user of Yelp when I am in a new neighborhood or city and looking for a restaurant. I definitely pay attention to the ratings and reviews – and reinforced this practice on a recent trip to Boston and Maine this year when we found two hidden off-the-beaten-path ‘gems’. You can download the ZMOT eBook from the Zero Moment of Truth website you can view the PDF below. You can also get the book on Kindle, Nook, iBook and at the Google eBookstore. Are you confused with where to start your social media journey? Are you stuck in a rut? Are there too many options to consider? Are you floundering without a social media strategy? Do you need to convince others about the importance of social media? 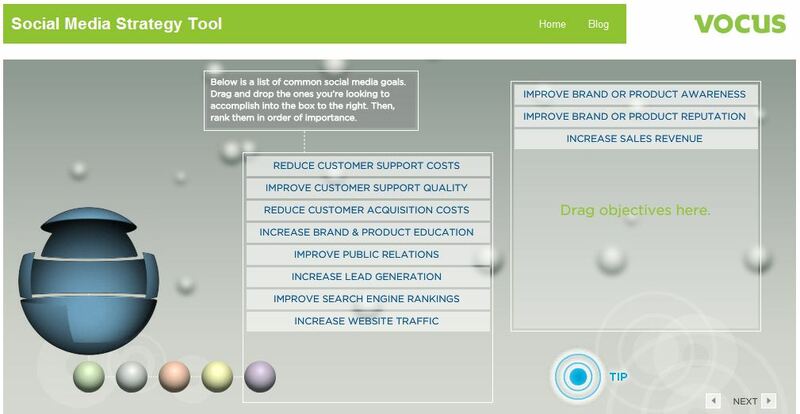 If so, you may want to check out the online social media strategy assessment tool from Vocus. Vocus provides on-demand software for public relations and social media management, and the interactive workbook was created with the help of MarketingSherpa, Beth Harte of the Harte of Marketing and Serengeti Communiations. At the end of each section, you can select a list of applicable resources that you may want to review in the final report. When you are completed with all 6 steps in the assessment, a customized PDF report is generated based on your responses in the workbook tool. The PDF is a great starting point for any social media strategy and includes additional worksheets that can be completed to refine your strategy. I highly recommend using the assessment tool if you are new to social media or in the experimental or transition phase. For experienced social media users, the embedded links are worthwhile as refreshers or to inject some new ideas into your existing processes. Verizon vs. The Tennis Channel is the latest social media crisis that is being mishandled — and since I am directly impacted, here are some suggestions to both sides on how to handle the issue better. It all started on Saturday night when The Tennis Channel pulled their signal from Verizon and Cablevision. 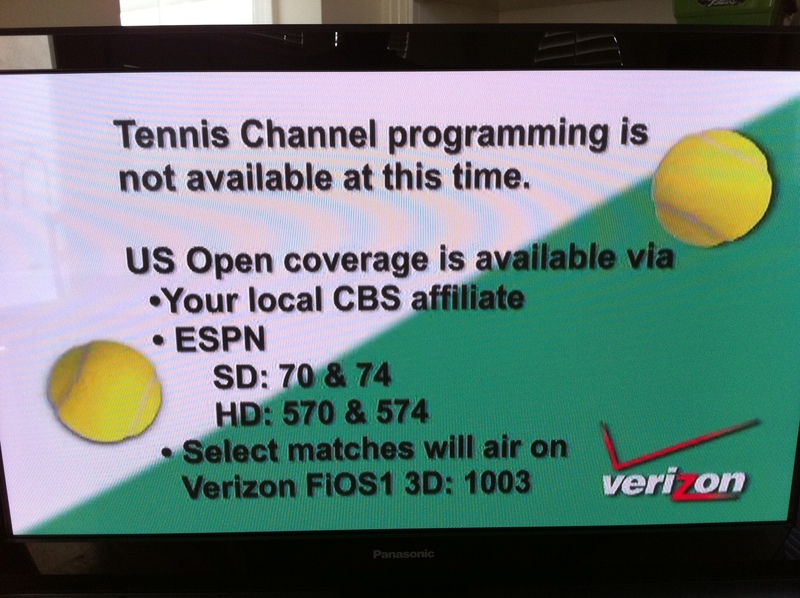 On Verizon FiOS, the Tennis Channel was replaced with this graphic that does not say why the channel is no longer available or when the channel will be turned back on. The bad news is that the timing could not come at a worst time for tennis fans as we enter the second week of the US Open. While I can still receive tennis programming on CBS and ESPN, we have been enjoying the coverage on The Tennis Channel – especially the commentators and the wrap-up shows. The Tennis Blog in the New York Times had some additional details to add in their post on Saturday. 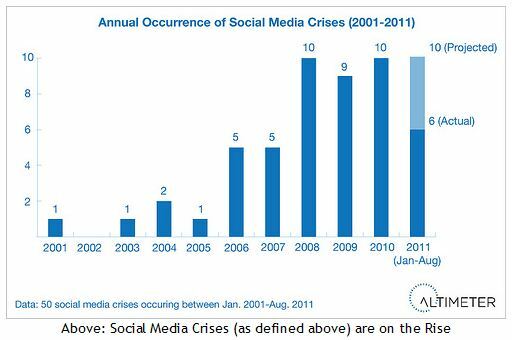 Social media crises are on the rise, but most companies are still ill-prepared for dealing with the best way to respond. In fact, Jeremiah Owyang of The Altimeter Group published a report on this subject last week titled “Social Media Readiness: How Advanced Companies Prepare”. It appears that Verizon Support was not prepared for the shutdown and as of this morning, they have not addressed the issue in their Twitter stream nor have they responded to any of the irate customer rants. Somebody somewhere in the Verizon bureaucracy must have known that the agreement was going to expire and there must have been meetings about what was going to be done. Unfortunately for Verizon, this information does not appear to have been shared with people on the customer front line. The Altimeter report has other suggestions for planning ahead and establishing a process and team to address crises. Since this issue occurred on Saturday night of the 3-day Labor Day weekend, Verizon was not ready to immediately respond to inquiries or to address the issue. Verizon’s Twitter account went complete dark from 10am on Saturday morning until this morning at 6am. It is apparent that the longer you wait to address an issue, the harder it is to recover from a crisis. At a minimum, Verizon needs to start responding on Twitter and in forum discussions with a rational and direct explanation of the why, the what and the when. Followup at 12:10pm on 9/6 – I just heard from the @fiostv Twitter account, and the executive on that channel was responding throughout the weekend as noted in the tweet below. However, none of these tweets were cross-referenced on the @verizon Twitter feed so I did not see them until after I wrote the post. In any case, it looks like the tweets were just acknowledging the situation without offering any new information. As a Verizon customer, I want an direct explanation from the source — how about posting an explanation on your website. Verizon did send me an email on Sunday morning, but it just announced that the Tennis Channel was removed from the FiOS lineup and they apologized for any inconvenience that it may have caused me. It is hard to tell which side is at fault in this dispute, but since I subscribe through Verizon I hold them to blame for the issue. But The Tennis Channel may be just as culpable, but without an explanation it is hard to hold them at fault. As a tennis fan, I am hoping the dispute is resolved quickly and amicably so I can receive full tennis coverage from the Tennis Channel. As a social media fan, I am hoping other companies are paying attention to this issue and don’t repeat these same mistakes again.